Follow me As I RENOVATE my Fixer Upper! Garage Door Insulation Kits - Do You Huddle With Your Garage Heater To Stay Warm? Trying to lower our heating bills is a top priority in cooler climates. So, we turn down our furnace, and we wear sweaters and we blow extra insulation in the roof, and we even invest in new windows, but the garage tends to get forgotten. This is where garage door insulation kits would really work well. If your house has the shop attached to it, and in some cases it is under the bedrooms, then you know that this is one of the biggest unheated areas in the house. Unless you already spent the time, money and effort to totally insulate it, then most likely it is as cold as ice when you walk out there. If you have a man door from the house to the garage, then you are going to be getting the cold air from this space into the house every time you open that door. Plus if this interior door is not sealed very well, then dollars are floating out of your house in higher heating bills. But there are a few things you can do. By getting insulation onto the big door, you can reduce a huge area on the wall of cold and drafts. These kits are a cheap way to stop drafts in there, and save some money if you have a heater out there too trying to keep the place warm. If you like to use this area for more than parking the car, or junk storage, and you need to use a heater out there, or maybe you have heat already installed out there, then consider getting a kit to insulate the big door. These kits come with everything you need for under 85 dollars. If you happen to have a double garage with 2 large doors, you can imagine just how much better the space will feel once you insulate both large doors. You can get these kits at most home improvement stores, or you can just get the insulation and figure it out yourself, but these kits are a great way to go. It has everything you need to create a less drafty and warmer area. They are designed so that you can still use the big door, they don't weigh it down, it will just be a lot less drafty and cold in there. If you heat it, you will retain more of your heat, and less cold air will get into the house. You may want to really have a good look at your garage door as well, and see if you need to replace any of seals, which you can also get in kits. If you also have a man door to your area that goes to the outside, you should check the door sweep and seals on it as well. In the really cold winter, and during winter storms, it does not take much for that wind to get through any cracks, and if you are trying to work on hobbies out there, then it can be a losing battle with your portable heaters unless you consider insulating that large garage door. So, if you want to stay warmer out in the garage with less drafts, then take a look at getting garage door insulation kits and save some money on heating. 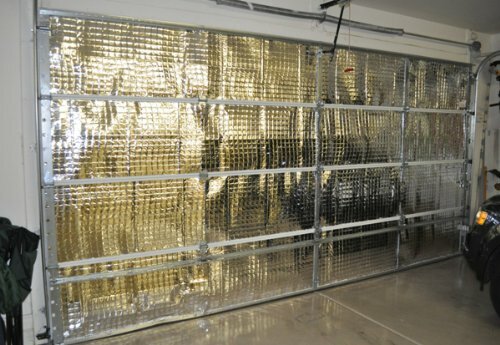 Reflective Garage Door Insulation Kit 2 Car Dr. R-5 (16'W x 7'H). there are many ways to insulate that space!